Diwan Magazine: Kirlian Photography of Life Energy in the Orgone Accumulator? A Simple Experiment for Photographing Life Energy? Did Wilhelm Reich's Orgone Accumulator Create Kirlian Photographs Using Life Energy (Orgone Energy) Instead Of High Voltage Electrical Fields? Many researchers in the field of life energy investigation have tried to demonstrate life energy or life energy fields using photographic methods. Indeed, this would be an ideal technique for researching the subject and visually could prove the existence of a specific energy of life. The psychotherapist, Dr. Wilhelm Reich, believed that he had found a way to accumulate life energy, which he called orgone energy. "Orgone energy field photographs can be made in a manner similar to that used to make Kirlian electrophotos, except that no electricity is needed," [DeMeo, English edition, pg. 98] asserts James DeMeo in his "Orgone Accumulator Handbook". He proceeds to introduce the technique of Thelma Moss, through which she apparently portrayed the life energy of plant elements, and continues by encouraging the reader to conduct the same experiment themselves. Place in an opaque box a piece of photographic paper together with the object one wishes to picture, and then place the closed box in the orgone accumulator. Wait awhile (DeMeo suggests anywhere from one to seven days). Develop the photographic paper. (However, DeMeo seems not to have conducted this experiment himself). 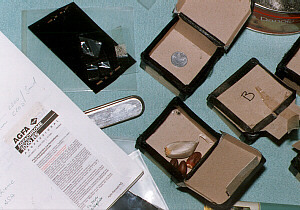 Picture 1 shows a few boxes and objects which Sigrid Bärndal and Bernhard Harrer used in a test series in 1990. Eva Reich, the daughter as well as long-time coworker of Wilhelm Reich, had given Thelma Moss the inspiration, Moss at that time was working on Kirlian photography at the University of California at Los Angeles. In Moss's 1979 book, The Body Electric, she describes how by using this method, she was able to reproduce pictures of lemon slices and meat. In 1990 in a controlled environment, Bernhard Harrer and Sigrid Bärndal conducted an experiment to expose photographic materials in an Orgone Accumulator. Many different types of materials like sand, plant elements, metal, magnets, and tablets of highly potensified homoeopathic remedies) were placed together with highly sensitive film slides into light-proof metal or cardboard boxes. In the first series, the boxes were placed together with the control boxes, consisting of sensitive film slides with no special objects, for eight days into an orgone energy accumulator with nine double layers of iron and rock wool. In the second run, the boxes were placed for twelve days into the strongest orgone accumulator of a renown Berlin manufacturer (25 double layers). Afterwards, the film material was developed immediately. The photographic materials used were Orwo UT 21 (ASA 100) in the first run, it was developed by Bärndal und Harrer. In the second experiment Agfachrom 1000 RS (ASA 1000) was used, and the development was carried out in a professional laboratory which pushed the sensitivity to ASA 2000. This specific type of film was chosen for the experiment, because Wilhelm Reich attributed a blue color to orgone energy. Color slide film reproduces unadulturated (pure) colors, is highly light sensitive, and if need be, the laboratory can double its sensitivity. The piece of film which was stored in a humidity-proof box with a twig from the Juniper plant showed green spots, especially where the twig had been in direct contact with the film. On no other film was any evidence of exposure to light found. The results were weak; many different materials showed no image at all. However, the blossoming Juniper twig inspired us to conduct a third test. Could it be that a living, organic object like a Juniper twig or the slice of lemon which Moss used could trigger an effect? In any event, the piece of film that was placed together with the Juniper twig was moist and swollen after it was taken out of storage after twelve days in the orgone accumulator! A third test should explain the phenomenon. Thelma Moss had placed the lemon slices and meat directly on the film material. This we chose to do again with lemon slices. And this time, we used simple black-white negative papers with PE- and Baryt-Basis (Ilfospeed 3.1M PE-Paper and Foma Baryt-Paper). Indeed – the developed film showed changes which looked like possible light exposure. In order to illustrate the effect, after having removed the lemon pieces, we exposed half of the paper under an enlarger, and the other half we covered up. Exactly where the lemon was placed on the photographic paper, there appeared luminous spots. Where the skin of the lemon was still intact, the effect was slightly less. Only a mild grey appeared. Picture 2 shows these images. The reexposed image in Picture 2 is the upper, black part. How can one explain this phenomen? Neither orgone energy nor biophotons (Bischof 1995) are at work here. The reason for these pictures is the seeping fruit acid from the lemon slice, which, when in contact with the chemicals used for photographic materials, produces an image. 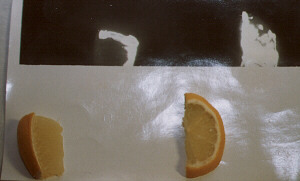 The acid spreads itself out millimeter-wide around the edge of the lemon slice during the photographic emulsion process which, subsequently, produces a small "Aura" effect. Due to the fact that acid seeped onto the photographic material, it was impossible for the developmental chemical bath to work, since acid hinders photographic development. It has nothing to do with the photographing of the life energy fields as Moss and DeMeo assert. Firstly, these are not really photographs at all, but rather they occur through a chemical reaction and not through an exposure to light. Secondly, there is no evidence that the orgone accumulator had any influence on the genesis of these pseudo-photos. Moss reports in her book that back even then, critics told her that the phenomenon occured because of a direct chemical contact. She would not let this explanation carry any weight, because in some cases where spots were seen, no direct contact had occured. However, this occurance also can be conclusively proven. Organic material continually gives off humidity and chemical substances, for example vapors and etheric oils. If this was not so, we would not be able to smell a lemon; they would never dry out; and a perfume bottle filled with pure lemon oil would never be empty. In a closed environment, the air and the substances will be quickly saturated with humidity, and the water and aromas will condense on the surface of the film. Have you ever asked yourself why an empty refrigerator should be kept open when it is turned off? Things begin to get moldy where there are organic substances on the surface. The condensation on the surfaces is inconsistent, because the microscopic impurities act as condensation cores on which small drops precipitate. In the vicinity of the drops, the gas pressure (let this be water or etheric oils) due to physical reasons is so different that the drop can only grow to a specific size. In the cited experiments, it oozes into the photographic material and changes its characteristics, and even produces a chemical reaction. This is how we believe the spots described by Thelma Moss had occured. Exactly this is what our blossoming Juniper twig taught us. El Cerrito, CA: Natural Energy Works, 1989. Can be ordered through Zweitausendeins, Postfach D-60381 Frankfurt am Main (available only in German). Moss, Thelma: "The Body Electric: A Personal Journey into the Mysteries of Parapsychological Research, Bioenergy and Kirlian Photography". Reich, Wilhelm: "The Oranur Experiment: The First Report". Reich, Wilhelm: "The Cancer Biopathy: Discovery of Orgone, Volume 2".